A self drive itinerary perfect for those with a thirst for adventure. 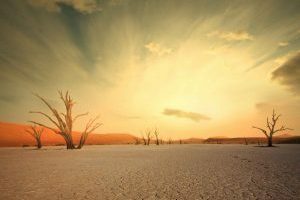 Namibia is the best self drive country in Africa with an excellent, well maintained network of tarred and gravel roads taking the intrepid adventurer to some of the most beautiful and remote regions of this stunning country. Your journey starts in the Namib Desert, world famous for its spectacular dunes which change colour as the sun rises and falls. The next leg of your journey takes you across the desert to the old whaling centre of Walvis Bay. A catamaran trip and dolphin cruise is included. The rich Benguela current creates a rich marine environment home to whale’s, seals and dolphins. 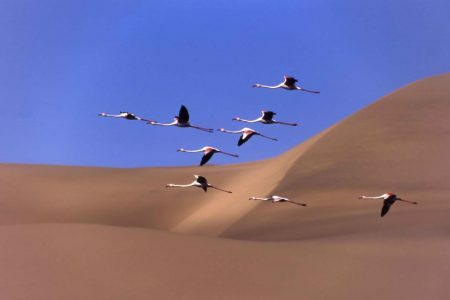 The surrounding salt flats are home to many birds including Flamingos and Pelicans. 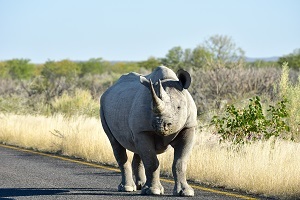 Continuing your journey ninland into Damaraland, you will explore a huge wilderness and incredibly photogenic region, home to unusual desert adapted wildlife, including the last free ranging black rhino on earth and the fascinating Herero and nomadic Himba people. The final leg of your journey takes you to Okonjima, home of the AfriCat foundation and one of the best places to see big cats up close and personal. 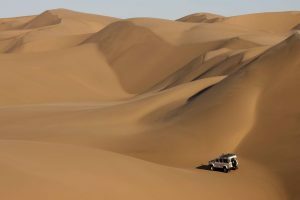 “Northern Namibia Overland ” is a very high quality self drive and safari experience staying in some of the most beautiful parts on Northern Namibia. 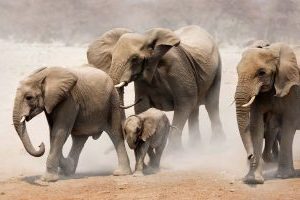 In addition to guided game viewing and other safari activities in some of Namibia’s more remote locations the opportunity to conduct your own game drives in Etosha National Park adds an extra element of adventure. Truly spectacular desert and mountain landscapes, coastal scenery and fascinating culture add to the package. A breath-taking journey of adventure and wonder that will leave you with wonderful images and memories for many years to come, a true “bucket list” experience. Your safari can be extended to include additional locations or longer stays at included destinations. 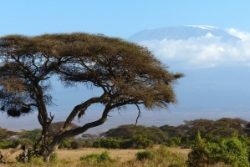 This itinerary is a must for guests who have a spirit of adventure and who would like some independence on their holiday.